The original colonists brought with them the traditional folk music of their homelands. There were no songbooks with notes in the Volga colonies, but they lived on in the memories of older people and were renewed through the singing of young single men. and who composed the tune? For young people, singing Gasse Lieder (street songs) was a primary form of recreation and amusement. The Gasse Lieder could often be playful and sometimes bawdy. Young men would gather at a street corner and take up a song and then proceed to a girl's house where they would sing the most beautiful songs they know including love songs and ballads. Then they would go to meet their girlfriends and continue the singing with continuous variations and embellishments. Some played the harmonica and there was often dancing with the girls until it was time to take them home. On warm summer evenings, the songs didn't end until the early morning. Songs were exchanged when farmers from different colonies met for a rest in the fields or on the roads between villages. This practice made the number of songs and variations almost inexhaustible. Two of the favorite songs were In einem kühlen Grunde da geht ein Mühlenrad (Down in the Cool Meadows, a Mill Wheel Turns) and O Straßburg, O Straßburg, du wunderschöne Stadt (O Strassburg, O Strassburg, You Beautiful City) which were reminders of their ancestral homes. Many of the religious holidays incorporated folk singing and dancing along with religious music. Young people as well as the older generations would dance fast polkas and the "skipping" waltz (known in North American settlements as the Dutch Hop). Bands would play on festive occasions such as holidays and weddings. 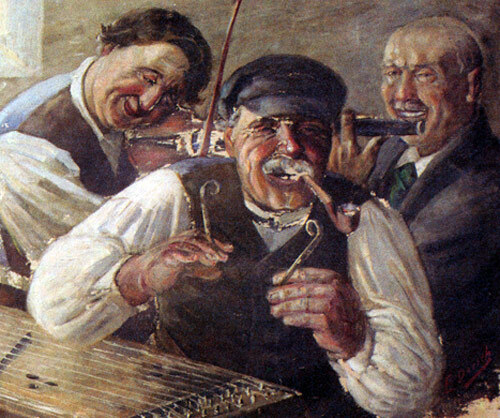 Commonly used instruments were the Hackbrett (hammered dulcimer), Zieharmonika (accordion), violin, and brass instruments. The accordion was invented about 1845 in Vienna, Austria and it would have taken some time for it to find its way to the lower Volga region. Prior to that time, the violin provided the primary structure to the music. George Dinges recorded the music and lyrics of many Volga German folksongs in his book titled Wolgadeutsche Lieder (Volga German Songs). Georg Schünemann also published a large number of folk songs in his book titled Das Lied der deutschen Kolonisten in Russland (The Song of the German Colonists in Russia). A drawing from the book "Wolgadeutsche Volkslieder" (Volga German Folk Songs) by Georg Dinges, published in Berlin in 1932. Traditional Volga German polka music and dance became known as Dutch Hop in the United States and Canada. The word Dutch is a misnomer that most likely came from a misunderstanding of the word Deutsch (German). Many Volga Germans say their ancestors deliberately ignored the misunderstanding because of the widespread anti-German sentiments they encountered during World War I. So, the music remains Dutch Hop to this day. 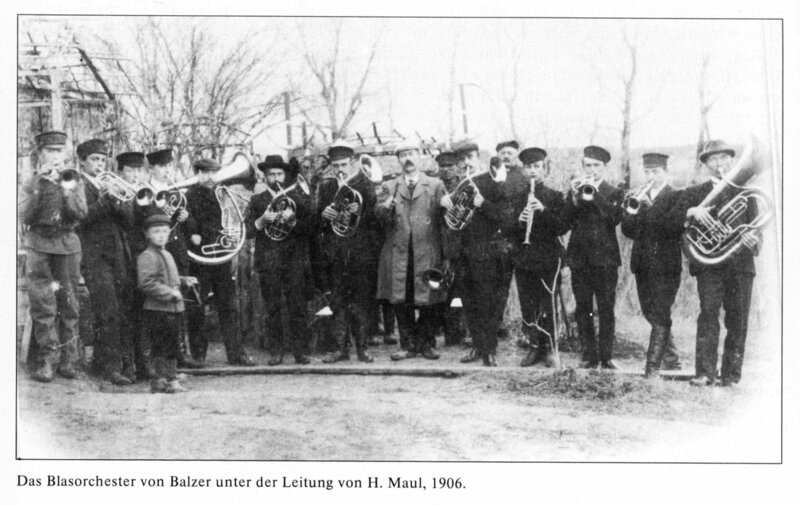 Photograph of the brass band from the nearby colony of Balzer under the direction of H. Maul. Source: "Heimatbuch 1992-1994" published by the Landsmannschaft der Deutschen aus Russland. Dinges, G. Wolgadeutsche Volkslieder Mit Bildern Und Weisen (Volga German Folk Songs with Images and Ways). Berlin: W. De Gruyter, 1932. Print. Olson, Marie Miller, and Anna Miller Reisbick. Norka, a German Village in Russia. Lincoln, Nebraska: American Historical Society of Germans from Russia, 1986. 22. Print. Schünemann, Georg. Das Lied Der Deutschen Kolonisten in Russland. München: Drei Masken Verlag, 1923. Print. Walters, George J. Wir Wollen Deutsche Bleiben (We Want to Remain German): The Story of the Volga Germans. Kansas City, MO: Halcyon House, 1982. Pages 133-175. Print.